more than half of US states spend more than 85% of their pavement dollar on only one pavement type? of U.S. states can benefit significantly from instilling competition into their pavement type selection process. you can buy as much as 17% more lane miles with the same investment by instilling competition between industries. Competition Paves is the theme of this industry alliance, whose advocacy and outreach efforts are focused on communicating the benefits of competition in constructing, preserving, and rehabilitating the nation’s surface transportation infrastructure. Sponsored by the Alliance for Pavement Competition, Competition Paves demonstrates the enhanced cost-savings and improved value to agencies/owners, taxpayers, and the traveling public. With competition, everyone wins! Get more information about how competition can help agencies pave more with less. 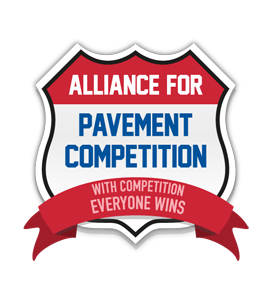 ©2015, Alliance for Pavement Competition, Fairfax, Va. “Competition Paves” is a trademark of the Alliance for Pavement Competition and may not be reproduced or distributed mechanically or electronically without the expressed written consent of the trademark holder.